If you’re like a lot of course designers, you probably have a stronger background in education or writing than you do in graphic design. And if you’re working on a one- or two-person team, that means you’re responsible for everything from instructional design to visual design to multimedia design. E-learning is a visual medium, so it’s just as much about visual communication as it is about learning design. While you don’t need to be a graphic designer to build effective e-learning, understanding some essential design concepts will help you make more deliberate choices when placing objects on your slides, while influencing how your learners interact with your content. 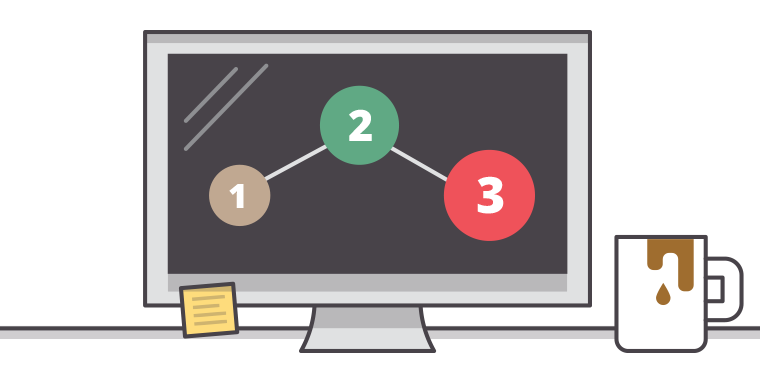 Here are three simple—yet highly effective—visual design tips that will help improve your course content and make your e-learning more interactive. If you’ve ever looked at an e-learning course slide and wondered, “What should I be looking at?” you’re not alone. One of the most common mistakes course designers make is using too little, or too many, contrasting slide elements. Learners focus on what’s different. When everything on the slide is different, there’s no contrast or focal point. Contrast is a really important design concept because it helps learners distinguish and visually organize the slide elements. Contrast also plays a large role in directing the learner’s eye to what’s important. There are many ways to show contrast between two or more slide elements. Let’s look at three of the most commonly used elements in e-learning. Text is one of the largest and most important graphical elements you’ll use. It's also a critically important communication tool. The more you can help learners understand what’s important, the easier it will be for them to digest the material. Every course includes the two most basic types of text: headings and body text. While you can use text in many other ways as well, these two types are common to most every course, so we’ll focus on those in this example. Contrasting colors can be used to effectively guide your learners through a slide and help them focus on what’s most important. A common mistake course designers make is using too many colors on their slides. While there’s nothing wrong with using multiple colors, the goal should be to emphasize the elements you wish to draw the learner’s attention to at a given time. Here are a couple of examples of slides. While both slides use contrasting titles, there’s no color distinction among the slide objects. An easy way to draw a learner’s focus to a specific element is to use contrasting colors. Contrasting light and dark, otherwise know as values, can also help direct the learner to focus on what’s important. A simple way to contrast graphics is to apply moderate transparency to one or more graphics to give the non-transparent objects dominance. As learning designers, you know that one of the best ways to reinforce content is through repetition. Repetition is the mother of learning, right? Did you also know the same concept of repetition also applies to your course design? If you’re like most course designers, you build your courses using a variety of content provided by your clients or subject matter experts and content you’ve sourced or created. This means that you probably use content from multiple sources—PowerPoint, documents, web pages, and guides. The downside of pulling content from multiple sources is that it can create inconsistency among your slide elements. Sometimes it can be a glaring difference like an inconsistent color palette, image style, or font. Other times it can be a more subtle inconsistency, such as where you place buttons, instructions, or wording on a button or navigation item. Navigational elements: Objects such as buttons, menus, and icons should share a common theme or design style. Navigational elements should also be placed in the same place throughout the course. The last thing you want learners doing is closing your course because they couldn’t find the Next button. Graphic elements: The graphics style and theme you choose should complement your course topic. Often referred to as the visual voice of your course, the graphics should have a connection with one another. For example, you don’t want to mix and match hand-drawn, sketchy arrows with high-gloss, pixel-perfect stock icons. The graphics you choose should have a similar look and feel. Font choices: Establish a basic style guide for your course to include heading, body, and caption fonts, and stick to those fonts for your entire course. Most of your courses will have similar structures, so plan on defining your fonts at the start of each project. Colors: Select a harmonized palette at the beginning of your project and define the way each color will be used in your course designs. Programs like PowerPoint, Photoshop, and Storyline allow course designers to create custom color palettes so new colors aren’t inadvertently introduced during development. Your e-learning slides don’t build themselves. Everything on your slides—text, graphics, images, videos, and characters—are there because you placed them on the slide. If your content is well-organized, it looks polished and makes it easier for your learners to sort through and digest what they’re learning. But if your slides include a bunch of randomly placed pieces of content, your course will look disorganized, and it will be difficult for your learners to find and process the information they need. The good news is that it’s easy to align your content to create meaning, relationships, and focal points. One of the easiest ways to align your content is to set up a simple grid. A grid is a layout created with intersecting horizontal and vertical lines, which you can use to structure content and organize graphic elements, such as images and text. Grids allow you to organize your content easily and consistently. Typically, a design based on a grid will be very readable and have a professional, polished look and feel. And a side benefit to using grids is that they remove a lot of the guesswork from adding new content to each slide. Grids don't have to be restrictive and suffocating. They can be as simple as using a few lines placed equidistant on your slide. Now that you’ve learned the basics of contrast, consistency, and alignment, you can see that you don't have to be a designer or an artist to produce professional-quality courses and communicate visually with your learners. Now it’s time to experiment with your new skills. So try out each of these elements in your next e-learning project and tell us how you did by posting on the E-Learning Heroes community. And if you’d like to go deeper into visual design, download the Essential Guide to Visual Design e-book. The nice thing about these tips is they are easy to retro-fit into a review of existing content - especially for those of us new to ID, like me. I wanted to add "whitespace" to the equation - although I definitely see it as implied in each of the above tips. Thanks for this. Really nice tips. allow people to lock deeper into online courses and it's simple tips to starters. The simple, the better!